Hosta plants are best known for their color and texture, and their ability to grow in shady areas. Many hosta plants also produce beautiful, sometimes fragrant flowers. Once established, hostas can also be easily divided, giving you healthy, new hosta plants very easily. But how do you determine which species of hosta is best for your garden conditions, and when is the best time to divide and plant them? Flowering hosta plants usually need a little more sunlight than non-flowering types, and this is particularly true for hostas which produce fragrant flowers. How much sunlight these plants need will depend on the strength of sun in your own garden zone, so prepare for some trial and error before you discover just the right location for them. In most cases, it’s safe to plant flowering hostas in a location which receives morning sunlight, and shade in the afternoon. The morning sun is not as strong as the afternoon sun is, and the light doesn’t last as long either. If you’re growing hostas mainly for their gorgeous colorful foliage, rather than the flowers, then use this basic rule of thumb – the darker the foliage, the more shade the plant can handle. There are exceptions, however; for instance, the best planting location can depend more on the color of the hosta’s foliage than the darkness of that color. If you’re unsure, ask at the garden center for specific planting recommendations. Hosta plants with golden colored leaves tend to do better with a bit more sun. The sun actually helps bring out the color of the foliage in all it’s glory. A hosta plant with blue colored leaves though, will do much better in shady areas. It can live in mostly shaded locations, or fully shaded locations. Generally, partial to full shade is recommended for hosta plants with variegated foliage. Too much shade may result in the hosta losing its variegated foliage and returning to monochromatic green. When selecting the variegated varieties, you’ll be able to choose between hostas with lighter colors in the center of their leaves, while others have the lightest colors at the outer edges. If you live in a climate which has strong, hot sunlight, look for a garden location that offers heavily filtered sunlight, or light shade all day long. Hostas are fairly easy to care for, because their growth habits tend to choke out weeds. Hosta plants do need plenty of water and good drainage though, and this can make growing them in hot climates a bit difficult. Adding about two inches of mulch around your hostas can help retain moisture. There is much debate about fertilizing hostas, but a good all-purpose 10-10-10 fertilizer is often recommended by expert hosta growers. According to the American Hosta Society an annual feeding of slow release fertilizer will keep your hostas happy. 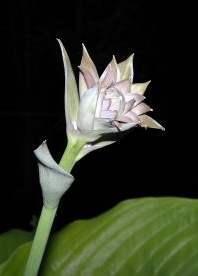 Once the hosta has finished flowering, it is usually advisable to cut down the flower scapes, allowing the plant to store more energy in the crown. The leaves can be left on the plant to decompose over winter, but if you find this too unsightly, cut them back and add them to the compost heap. Propagating hostas is a rewarding experience which can be done at any time during the growing season. Spring division is preferred, although you can even divide hostas in mid-summer, providing you keep the new plants well-watered until established. To divide a hosta plant, dig up the root ball and set the plant on its side. Cut through the crown and roots with a sharp knife that has been dipped in a fungicide or a 10% bleach-and-water solution. You can cut the hosta in half to make two separate plants, but if the mother plant is quite large, you can make more divisions, providing that each new plant has one or more growing tips. Dig holes for the new plants. You may wish to amend the soil, adding about one third peat moss and one third organic material such as pine bark fines. Set the plant in the hole, backfill with soil and water well. Hostas have a dedicated following, so it is no wonder there are many hosta societies available where you can meet fellow gardeners to learn more about this favorite plant. Your local hosta society may also organize a plant swap each spring, which is a great way to acquire different hosta cultivars. The American Hosta Society has lots of good advice on growing hostas, plus a well-organized listing of local hosta societies.